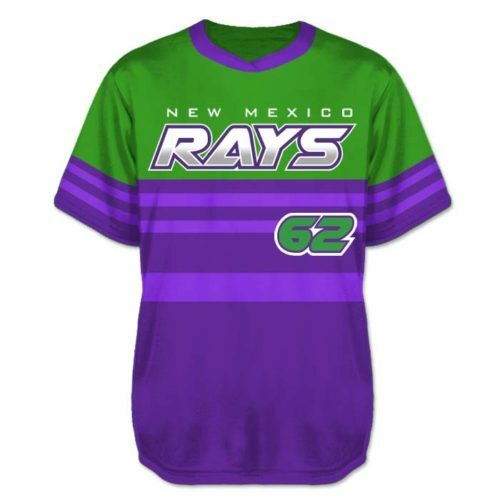 Price Includes: Custom Sublimated 2-Button Jersey with ALL DECORATION including team emblem(s), player number(s) and player name. Add flags, sponsor logos, etc. at no additional cost. Other cuts available at different price points. 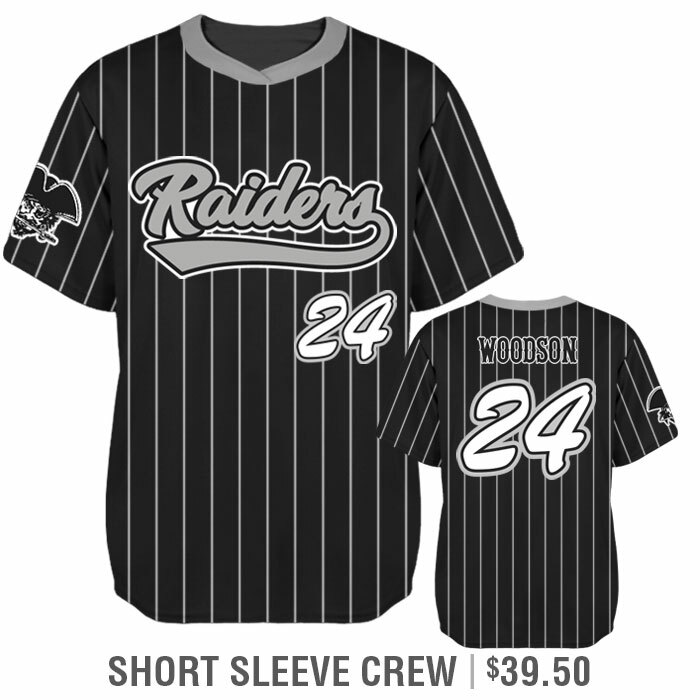 – Pricing for our Elite Pinstripe Custom Baseball Jersey is for the Short Sleeve Two-Button option. – You may choose from 2 other sleeve styles. 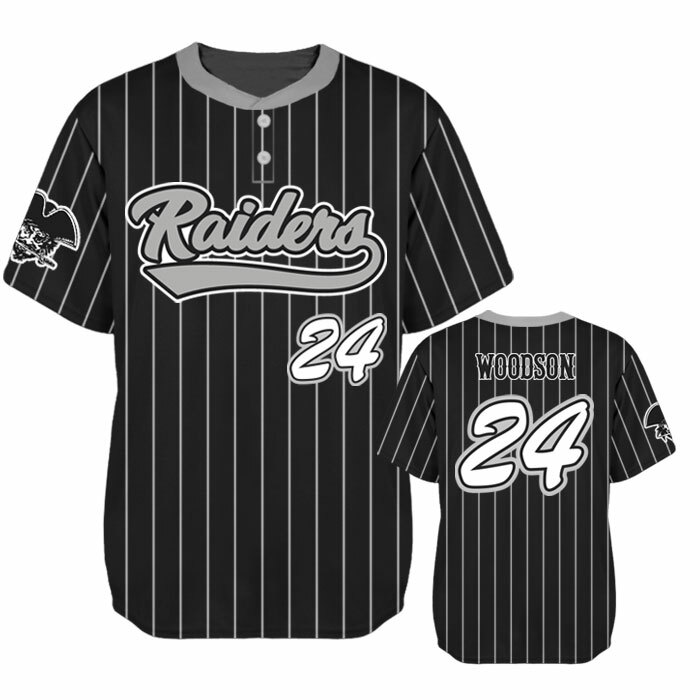 – Choose any 3 colors to create your own Elite Pinstripe Custom Baseball Jersey. – AEROFIBER: A pin-hole mesh fabric more resilient to snags and pulls. – Jersey includes team name or logo (including graphic) in an unlimited amount of colors. – Numbers can be placed on front and back of jersey as well as either the right of left sleeve. Numbers can be 1, 2 or 3 colors in any font style or our TSP Exclusive American Flag pattern fill in Athletic, Demonized or Chuck Noon font options outlined in any 1 or 2 colors of your choice. – You can also add additional text, graphics and/or watermarks to multiple locations on this jersey, for no additional cost. – Player names are also included, in up to 3-colors in any font in a straight or arched orientation. – An American flag or any State or Country’s flag, can be put on the jersey, on either sleeve, on the right or left chest or back above the number, at no additional charge. – The ELITE PINSTRIPE CUSTOM BASEBALL JERSEY DESIGN, TEAM NAME & NUMBERS are SUBLIMATED — that means they are dyed directly into the fabric — which means, you don’t feel them at all. And they don’t peel, crack or fade. • Gridiron embroidery to match Gridiron. • Gothic Block embroidery to match Anderson. • Tiffany embroidery to match Tiffany. • Full Block embroidery to match Athletic Block.